Proof that books alone cannot make a room, or, in this case, a corner, interesting. And in what world is a tufted leather ottoman-aspiring-to-be-a-chaise-longue any sort of substitute for a decent reading chair? What a waste of decent natural light to not have a lovely comfy reading chair! I agree. I like the bookshelf but the ottoman — no! Looks very designed/staged. I definitely wouldn’t like to try reading on that – you need good back support!! The recliner has a too-low back for comfort. But this room as ‘potential’! The little table is a tad too small, too, for book, glasses, cup of tea or whatever. I love the comments above – my thoughts exactly! This looks like it was designed and put together by someone who designs rather than reads! Reminds me of a brand new school I once taught in – on first day we arrived to set the school up, it had these fantastic, imaginative and creatively designed tables and chairs – but we pointed out to the architect there weren’t enough of the chairs or tables for the 30 kids in every class – he replied that in his design he hadn’t envisaged all the pupils ever needing to sit down at the same time!!!!! It definitely needs a wing-backed recliner! Whew! I saw the picture and said “meh…” and then read that you didn’t like it either. At first I thought one of us was slipping. This room is for someone who knows that they will fall asleep after reading one page, but refuses to admit it and just go to bed with the book. This does beg a better chair and table, doesn’t it? Not my favorite, but, enjoyed reading all the comments. I did want to tell you that, after first reading about “The Gardener’s Year” by Karl Capek some time ago here on your blog, I suggested it to our horticulture group, a committee of our garden club. Finally, this January, we read and discussed it; 10 wonderful gardening women around a table on a very cold morning. It was a spirited, lively conversation that led from Capek’s wit to discussing how few have read translations, especially from the Czech, and on and on. Just wanted you to know, Claire. Often, we write and post and don’t know that we’ve made an impact on others – you have. Thank you. Those actually look like real books, though I’d guess the horizontal stacks are more design than the lack of space of a real biblioholic. It’s nice to read in the magazines that I am “trendy” because I have books stacked sideways, but that is cancelled out by my refusal to waste shelf space on framed photos (here) or other “spacers.” I agree with LauraC above, that chaise is made for napping. 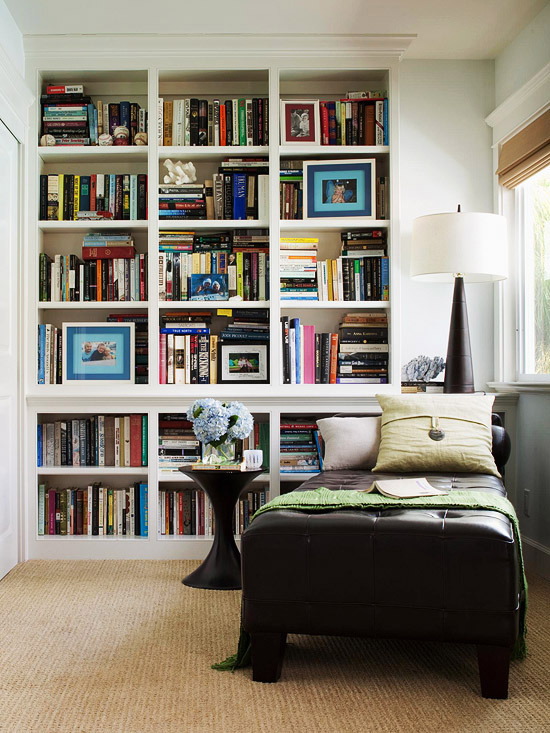 on January 25, 2014 at 16:52 | Reply Karen K.
Love the bookshelves and the window give great light for reading — but that piece of furniture is confusing. Is it a chaise? An ottoman? I know my dog would enjoy lying on it, but is it big enough for an adult? I’d have to try it out first. A recliner would be better. I agree with many comments above, but the picture does show potential that a small room (or alcove) has.